It's easy to find information on line about the benefits of eating more fish, but below I've assembled some that I thought were particularly interesting -- feeding your kids a healthy, brain friendly diet will most likely help them do better in school. Essential fatty acids (EFAs) cannot be made by the body and must be obtained through diet. The most effective omega-3 fats occur naturally in oily fish as EPA and DHA. They are good for healthy brain function, the heart, joints and general well being. Oily fish contains EPA and DHA in a ready-made form, which enables the body to use it easily. The main sources of oily fish include salmon, trout, mackerel, herring and sardines. Low DHA levels have been linked to a higher risk of developing Alzheimer's disease and memory loss. DHA, is one of the most highly concentrated fats in the brain and known to play a vital role in the structure and functioning of the brain. But as the body cannot effectively make this fatty acid it must be consumed as part of the diet. Researchers highlighted that as many people fail to eat enough fish and seafood, the brain's performance is potentially compromised. Eating baked or broiled fish once a week is good for the brain, regardless of how much omega-3 fatty acid it contains, according to researchers at the University of Pittsburgh School of Medicine. The findings, published online recently in the American Journal of Preventive Medicine, add to growing evidence that lifestyle factors contribute to brain health later in life. "Our study shows that people who ate a diet that included baked or broiled, but not fried, fish have larger brain volumes in regions associated with memory and cognition," Dr. Becker said. "We did not find a relationship between omega-3 levels and these brain changes, which surprised us a little. It led us to conclude that we were tapping into a more general set of lifestyle factors that were affecting brain health of which diet is just one part." Lead investigator Cyrus Raji, M.D., Ph.D., who now is in radiology residency training at UCLA, and the research team analyzed data from 260 people who provided information on their dietary intake, had high-resolution brain MRI scans, and were cognitively normal at two time points during their participation in the Cardiovascular Health Study (CHS), a 10-year multi-center effort that began in 1989 to identify risk factors for heart disease in people over 65. "The subset of CHS participants answered questionnaires about their eating habits, such as how much fish did they eat and how was it prepared," Dr. Raji said. "Baked or broiled fish contains higher levels of omega-3s than fried fish because the fatty acids are destroyed in the high heat of frying, so we took that into consideration when we examined their brain scans." People who ate baked or broiled fish at least once a week had greater grey matter brain volumes in areas of the brain responsible for memory (4.3 percent) and cognition (14 percent) and were more likely to have a college education than those who didn't eat fish regularly, the researchers found. But no association was found between the brain differences and blood levels of omega-3s. (There's more good stuff in fish than just omega 3s). "This suggests that lifestyle factors, in this case eating fish, rather than biological factors contribute to structural changes in the brain," Dr. Becker noted. "A confluence of lifestyle factors likely are responsible for better brain health, and this reserve might prevent or delay cognitive problems that can develop later in life." 13-year-old Evan O'Dorney of Danville, Calif. won the Scripps National Spellling Bee in 2007 (he came in 14th in 2006) with the tradition of eating fish for dinner before every competition, except for the big one he won, because they didn't offer it on the menu. Evidently he'd had enough already to keep him smart. In 2011, as a senior in high school, this fish-eating wonder won the top award of $100,000 from the Intel Foundation for his mathematical project in which he compared two ways to estimate the square root of an integer. Evan discovered precisely when the faster way would work. As a byproduct of Evan's research he solved other equations useful for encrypting data. This furthered an interest he developed as early as age 2, when he was checking math textbooks out of the library. He went on to Harvard, where he won even more awards and accolades. I know, I know, a sample of one. But he eats fish regularly and is really, really smart! His favorite food - a tuna sandwich. Want your kids to do well in school and go to college? Feed them fish, every week! Is Fish Healthy to Eat if You're Pregnant? I was listening to NPR in my car the other day, when a woman who was being interviewed, a conservative Republican who was also an environmentalist, was saying that she was awakened to environmental issues when her obstetrician told her not to eat fish when she was pregnant. Any doctor who would say that to a pregnant woman should be either de-licensed or re-educated as to the value of eating fish while pregnant. Her doctor needs to catch up on his reading. Medical research, of which there is a great deal on this subject, clearly shows that women who eat a lot of fish during pregnancy give birth to healthier, smarter, more physically coordinated babies. The Seychelles Study and the Avon Study in England followed pregnant women and their children for decades, and the results were unequivocally in favor of pregnant mothers including fish in their diets on a regular basis. The Avon Study, in summary: "Researchers followed nearly 12,000 mother/child pairs enrolled in the Avon Longitudinal Study of Parents and Children (ALSPAC) to assess the impact of factors such as diet and lifestyle on health and growth during pregnancy. Mothers who eat the most seafood during pregnancy -- more than 12 ounces per week -- have children with the highest developmental outcomes. Researchers conclude advice to limit seafood consumption could be detrimental to optimal fetal development." An on-going study in the Seychelles found similar results: "An exhaustive study of 643 children from before birth to 9 years of age shows no detectable risk from the low levels of mercury their mothers were exposed to from eating ocean seafood, according to a study in the May 16, 2003 issue of The Lancet. Children born to mothers-to-be who ate an average of 12 meals of fish a week - about 10 times the average U.S. citizen eats - showed no harmful symptoms. The study by scientists at the University of Rochester Medical Center is the latest in a series of updates on children who have been studied since their birth in 1989 and 1990 in the Republic of the Seychelles, an island nation in the Indian Ocean. The children have been evaluated five times since their birth, and no harmful effects from the low levels of mercury obtained by eating seafood have been detected. 'Consumption of fish is generally considered healthy for your heart, yet people are hearing that they should be concerned about eating fish because of mercury levels,' says lead author Gary Myers, M.D., a pediatric neurologist. 'We've found no evidence that the low levels of mercury in seafood are harmful. In the Seychelles, where the women in our study ate large quantities of fish each week while they were pregnant, the children are healthy.' "
When doctors in the US just tell their pregnant patients not to eat fish, they are potentially harming the unborn babies. Fish is full of healthy minerals, vitamins and protein, and the omega 3's in fish are essential to brain development in babies. Perhaps steer them away from shark and large swordfish, and fish that's caught in unclean waters (i.e. not commercially harvested) but the vast majority of it is good for the mother and good for the unborn baby. Mercury is in our environment - both caused naturally and from industrial and power plants. It would be great if industry cleaned up their act - in fact it's essential to stop global warming - but it shouldn't keep women from eating good quality commercially caught seafood while pregnant. Cattle that graze on land near coal fired energy plants contain mercury as well - who's warning people about that? Most of the people who come to our house for dinner are people whom we know, and we know that they like seafood. But since some people have allergies and digestive issues (me, too) I always ask about dietary restrictions if someone new is coming for a meal. We have one friend with a severe allergy to clams - but he eats raw oysters. It's always good to ask. Summer and winter entertaining is different - in the summer, we like to grill and sit outside, so we lean towards simpler menus. I like things that can be prepped in advance, so that I don't have to spend a lot of time away from my guests. One of my favorite hors d'oeuvres is a Garlic Basil Shrimp recipe - CLICK HERE to see that recipe and several other tasty shrimp recipes. Many people who don't want to eat fish will happily eat shrimp. The garlic basil marinade should be made in advance, and the shrimp can be put on skewers and marinaded for half an hour before the guests arrive. Then all you have to do is grill it for 2 to 3 minutes and serve. We like to start off with a bottle of bubbly - it makes everything seem more festive, and it's great with shrimp. For the main course, grilled Alaskan salmon is a big favorite. Sometimes I make my own pesto out of mustard greens or basil, sometimes I just get some from one of our stores - Jaime can make almost anything green into an amazing pesto. I add a green salad, usually with some fresh fruit on top from the farmer's market, and fresh sweet corn from the market as well. To cook the corn on the grill, I pull down the husk (don't remove it! ), take out all the silk, then put the husk back up. I soak the corn in a big pot of cold water for about an hour before cooking, then put the corn, still in the husk, on the grill just before I put on the fish. The corn cooks in about 10 minutes on the upper shelf in our gas grill. Let everyone pull down their own corn husk (they make a handy handle) and provide lots of butter. Another favorite for entertaining in the summer is Salad Nicoise - the recipe is in my July 9th posting - great, because you can do the whole thing in advance and just pull it out of the fridge and serve. Add some fresh crusty bread and a nice French rose or a Sauvignon Blanc for a blissful summer dining experience. 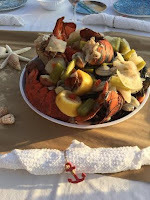 Of course, one of the primo entertaining experiences is a New England Lobster Boil - CLICK HERE for a wonderful lobster boil recipe. It can be made either with whole live lobsters, or with Maine lobster tails - the key is to have bibs and lots of napkins, and a crowd ready to dig in with their hands. This is definitely outdoor dining fare! One of our customers in Hinsdale sent us the photo to the right from her recent New England Lobster Boil party, which she proclaimed a resounding success. Love the terrycloth napkins perfect for a deliciously messy meal. For dessert, I tend to make use of all the great fruit available this time of year - fresh peach cake is a big favorite, or a Sherry Trifle, filled with lots of fresh berries, custard and whipped cream layered with sherry-soaked lady fingers. Not low cal. Summer is the time to take advantage of all the great fresh produce at the farmer's markets, and of course, all the great fresh fish!